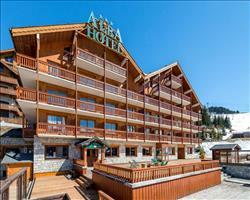 The location of the Mira Belum is really superb being just above the main square with easy access to both the apres ski and the slopes, especially with our complimentary minibus service to the lifts. The interior of the chalet is full of character with traditional beamed ceilings, carved door archways and comfortable furniture. The lounge/ dining area is dominated by a huge stone fireplace and provides perfect surroundings for the culinary highlight of the day. 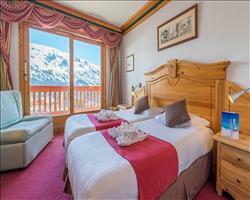 Large windows open up on to a large sunny terrace with wonderful mountain views that inspired the chalet’s name. This is where you find the hot tub so you can relax and watch the sun dip at the end of yet another fantastic ski day. All the bedrooms have private or en suite facilities and many have a balcony. There is a ski room with heated boot warmers and the lounge has a high-tech TV with DVD. The chalet is a lovely mixture of traditional with modern touches and we are sure that it will remain a popular choice amongst our Méribel chalets. 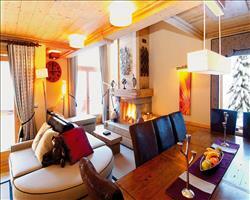 Ski-room with heated boot warmers. 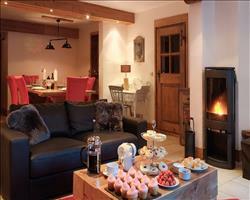 Open plan lounge and dining area with feature fireplace, and flat screen TV. Supplements per person per night: Bath/wc/balcony £4; Master bedroom £5. 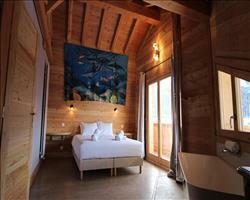 We update Chalet Mira Belum's details often, but facilities do change. e.g. some extras listed by the supplier as "free" or included might only be for the first time you use them, or for one time per party, then charged for further use. If any specific feature is essential to your holiday, make sure you ask us to confirm the details of it before you book your holiday. Meribel & Mottaret lift pass price last reported as €212 (adult 6 day). 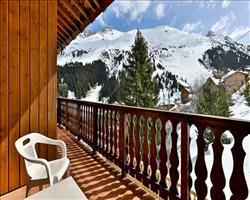 Ask for a quote when booking Chalet Mira Belum. 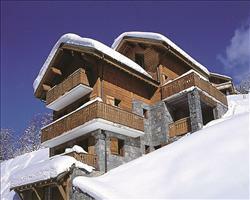 Taiga Lodge Meribel & Mottaret France, Gatwick to Geneva 15th December. 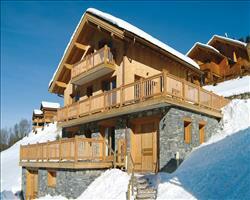 Refuge Boua Meribel & Mottaret France, Gatwick to Geneva 19th April. 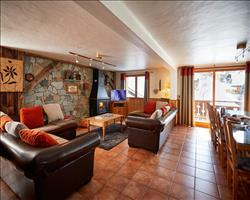 This chalet has a great comforting traditional charm with all the modern facilities that make memorable ski holiday in magical Meribel. It’s only a short walk into the centre (barely five hundred yards) in a good location for Meribel’s world famous après ski scene. 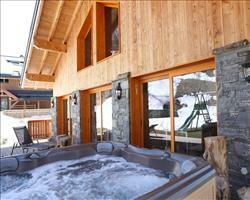 Alternatively enjoy the end of your day at the chalet, with the spectacular views from the balcony and hot-tub!